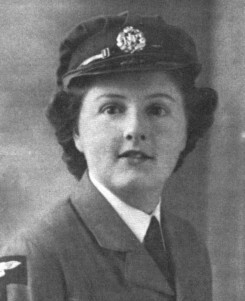 Vera Peggy Shep­pard was 20 when she joined the Women’s Auxiliary Air Force in Gloucester, England, in 1941. She was discharged in September 1946, after serving at a number of Royal Air Force stations in England. “I remember a squadron of Royal Canadian Air Force taking over our station and a handful of our unit, including me, working for them for six months,” she says. “We were really spoiled. I have good memories, of chocolate candies, food and invitations to all their entertainment.” Now Peggy Bloomfield, she lives at 59 Com­missioner St., Embro.